Google Play Downloader is a simple open source application which can be used to download APKs from Google Play to your computer. According to its developer, the application was created because he "didn't like [his] Android AOSP system being tainted by Google root services, neither being filed in the Google account database". Google Play Downloader isn't some piracy tool and it won't allow you to download paid apps and games. The tool can only download free games and applications and is useful if you want to backup Android APK files to your computer, if you don't want to install some applications directly via Googe Play for privacy or other reasons (for instance, you can use it with Genymotion, which no longer includes Google Play with its Android images) and so on. The application ships with everything you need to download APKs, like a Gmail account and Android ID, but you can change this (for instance, you can create a Gmail account especially for this) from the Google Play Downloader settings. If you change the email address in the Google Play Downloader settings, make sure you click the "Generate new Android ID" button (requires Java) or else downloading APKs won't work. Important note for Ubuntu users: the deb only works with Ubuntu 14.04 and 14.10. 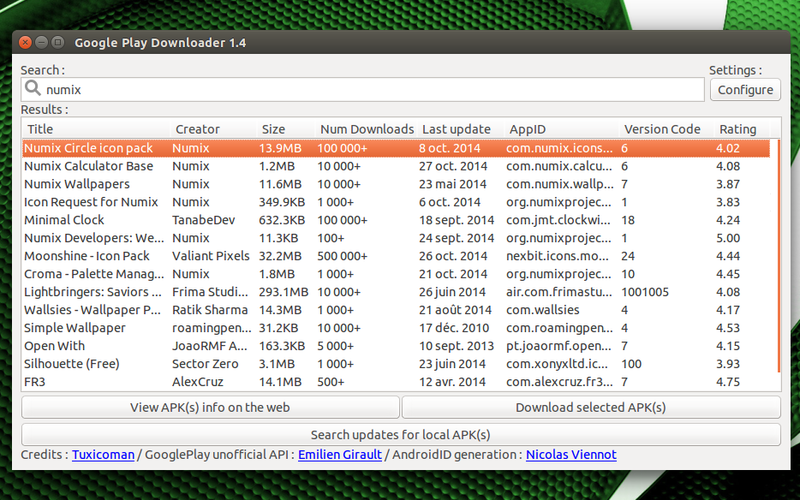 For Ubuntu 14.04, you'll need to download python-ndg-httpsclient from HERE and install it before trying to install the Google Play Downloader deb. Report any bugs you may find, HERE.